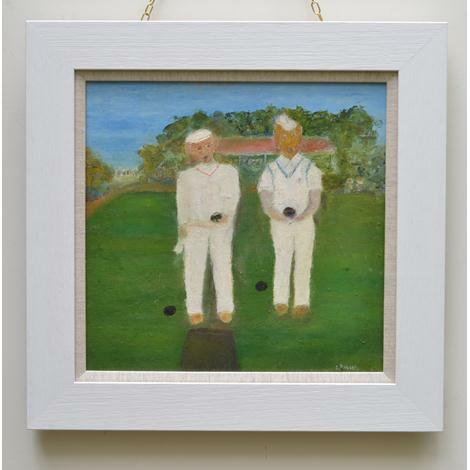 The bright, somewhat simplified imagery - with the neat, white clothes of the bowls players highlighted by impasto paint applied with palette knife and the small details of the team colours and logo scratched in with tip of brush and sharp pencil - conveys a peaceful, even cheerful, English scene. The sudden realisation that the figures are in the form of dogs - perhaps a terrier and a hound, surely both of uncertain breed - is almost shocking. The picture is comical and certainly entertaining, but there is also something disconcertingly surreal about it.